Welcome everyone to Pup All The Stations. 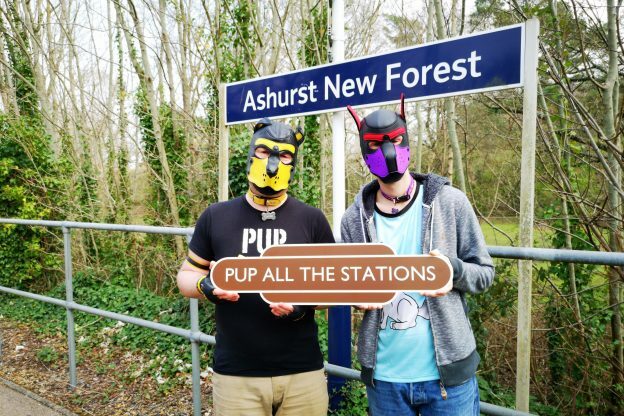 I’m Condor Briarpup, and I’m travelling to as many Great Britain based railway stations as I can before I die, getting a pup photo at each of them with the station signs, and making a small blog-type-thing about it. Why? Check the What & Why page to find out more. You can also see a map of the stations that have been “pupped”, not just by me, but by other pups from all over the world. You can keep an eye on the latest action by following #PupAllTheStations on Twitter, though some pups are also crossposting to other social media platforms as well. Note: Please do bear in mind that everything you’ll see on the Pup All The Stations website is safe for all, other pups social profiles may contain NSFW/Mature content. User discretion if following off-site links is advised. We have our very own Pup All The Stations totem! A smaller version of this picture has been put in the What/Why section, as it was looking a bit barren and in need of some nice photos. Other than that, Updates have been slow recently, but they’re still coming. More of the Circle Line stations are being added (Bayswater is the latest station to be added). This is what happens when you’re a sole blogger and you visit 36 stations in a day. Then you visit Moorgate to Finsbury Park. Then visit Havant… Plus all the pups adding more photos to the hashtag… Now I understand why folk have staff. Don’t forget, stations get date-tagged with the visit date, not the date I upload them, so you can see how far behind I am. This entry was posted in 1) Site News on April 12, 2019 by CondorBriarpup.